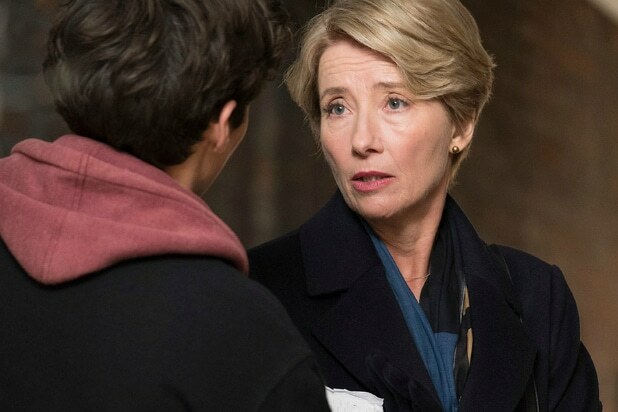 If Emma Thompson can’t make “The Children Act,” a drama about a family-court judge conflicted over her own decisions and the precarious state of her own family, into something interesting and meaningful, then no one can. And she can’t. Screenwriter Ian McEwan, adapting his own novel, and director Richard Eyre (“Notes on a Scandal”) have assembled a fine cast to tackle controversial subjects brimming over with dramatic possibility, but the results are stultifyingly subdued. It’s all so polite, so sober, so convinced of its own importance, that it never has a pulse. This is love and life and death discussed as though they were paint swatches for the guest room. Thompson stars as Fiona Maye, a high-court judge who specializes in hot-button issues that often put her in the crosshairs of religious fundamentalists. (The “Act” of the title is a noun and not a verb.) As the film opens, we see her giving the Solomonic ruling to separate a pair of conjoined twins, over the objection of the parents, as she argues that the possibility of one of the newborns living supersedes both of them definitely dying. Her next big case involves Jehovah’s Witnesses who want to keep their almost-18-year-old son from receiving blood transfusion treatments for his leukemia; before handing down a decision, Fiona takes the near-unprecedented step of meeting the young man herself to get a read on his devotion to his church’s teachings. Adam (Fionn Whitehead, “Dunkirk”) strikes her as lively and intelligent and capable of thinking independently from his parents — although he too wants to refuse the treatment — and the two of them sing a song together before she returns to court and rules that he must receive the transfusions. As a healthy Adam grows estranged from his parents and his faith, he begins stalking Fiona — in a friendly way, but it’s still a little disconcerting to her how he keeps turning up, even when she goes off to Newcastle for a business trip. While Fiona’s various work dramas are unfurling, her husband Jack (Stanley Tucci) registers his dissatisfaction with the marriage. He asks permission to have a mistress, but takes one anyway after Fiona says no — and kicks him out of the apartment. Is this going to be yet another movie where an accomplished, intelligent woman has to bear blame for not having children? You bet it is, down to a scene where Jack reads bedtime stories to visiting nieces, a moment designed to show us how great he is with kids (and thus implying how terrible Fiona is to deprive him of them). There are big ideas swirling around “The Children Act” about love and fidelity and spirituality and guilt and responsibility, but McEwan and Eyre have each of them either land with a thud or dissipate into the mist. We’re left with Thompson looking glum and unsatisfied, while Tucci tut-tuts and Whitehead has explosions of exuberance that get creepier as the film progresses. “The Children Act” is the very model of a handsome production, with Fiona and Jack’s London digs tastefully assembled by Peter Francis and shot with Architectural Digest specificity by Andrew Dunn (“Bridget Jones’s Baby”). The peeks behind the scenes at British courtrooms provide some of the film’s most compelling moments, as Fiona’s treatment of her long-suffering assistant provides one of the film’s few emotional barometers for its lead character until her big Act III moments. A film this steeped in respectability really wants you to take it seriously (and to consider it during awards season), but its many fine pieces never add up the way they should.